Freshly ground coffee served anywhere? Yes please! Outdoor events can be challenging for any outside caterer. The lack of power and water alone can make it tricky to serve hot and cold drinks and food. If you’ve been to an outdoor event or festival recently, you’ve probably seen a range of pop-up caterers. They were probably in a regular gazebo or tent and, more recently, you may have seen redesigned horse trailers? All of the above have been designed and planned to be completely self-sufficient at outdoor events. This is achieved by using smaller compact generators, gas-powered espresso machines and water tanks to name just a few magical gadgets. One of our customers, Josie, has launched her own vintage mobile catering company; giving her the ability to serve hot and cold drinks from her re-designed horse trailer. Now that Josie has her unique mobile catering horse trailer, she can take it anywhere. Whether it’s a food festival, a wedding, birthday party, music festival or farmers market, Josie can rock up in her trailer and do her thing. The trailer itself has a vintage style and appearance with bunting and wooden cladding. The trailer has a very well planned out and designed interior. This gives Josie and her team ample space to cook and serve. Space is definitely at a premium, so all of the counters have built-in drawers, pull out chopping boards and storage compartments galore. Josie and her team have used every inch of space possible. Josie’s vintage mobile catering company specialises in sweet and savoury crepes along with freshly ground coffee. Customers can enjoy freshly prepared crepes which have a variety of toppings to suit the sweet or savoury tooth. You can upgrade to a bubble waffle too (which sound amazing). Toppings for your crepes and waffles include healthy options like fresh fruit, or something a little naughtier like chocolate, caramel or sweets. Awesome crepes need awesome coffee, and that’s where we come in. Josie currently serves ‘The Tiny Horse’ (which is apt, as she has a horse box!) THe Tiny horse is a sweet and smooth speciality coffee from El Salvador. It’s creamy, biscuit-like sweetness tastes great with, or without milk. More importantly, with a crepe, it’s a taste sensation! 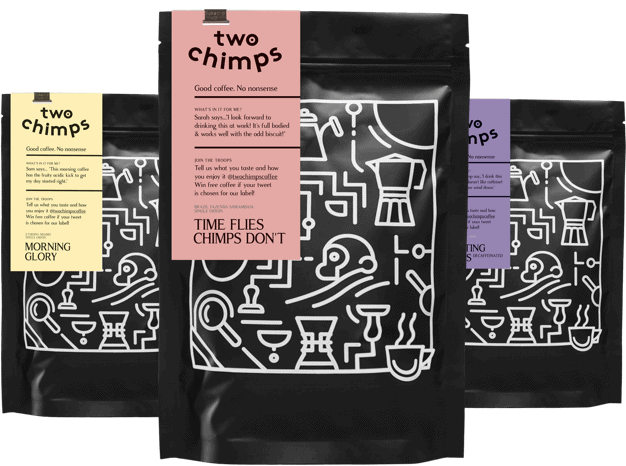 Here at Two Chimps we freshly roast and deliver coffee to Josie as and when she needs it for an event. This way the coffee she serves is always the freshest it can be. We also offer onsite barista training for her and her staff so they can learn to serve the coffee at its very best. The coffee is freshly ground by Josie and is served through her gas fired espresso machine which has been built into her carefully designed horse trailer. The team offer a variety of hot drinks including teas, hot chocolates and cold drinks. Do you already run outside events and would like to know more? Or are you thinking about starting your own outside catering company? Then look no further. We can help you with all your coffee needs! From how to make a variety of drinks to sourcing your takeaway cups, right through to barista training, including latte art.